So you mentioned Linux above, are you running this on a virtual Linux machine or side-loading Linux with Windows or? The PC is running Windows 8.1, and on that I’m running VMware Workstation. 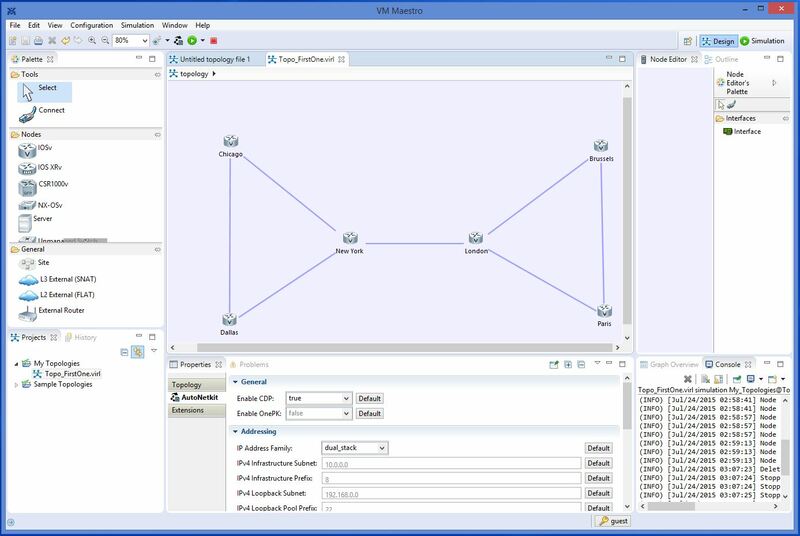 The actual network simulation software from Cisco is an OVA file (which is a fully configured server instance) that is Linux based, and runs on top of the VMware Workstation. Getting it all to work took a bit of time, but since I know Linux, I was able to poke around the Cisco VIRL server quickly. Very cool. I didn’t know about this virl. I always appreciate you teaching me about some good stuff. Can you let me know how much memory is used when virl is pushed to about 10 routers. I currently use gns3 for my ccie studies still as it seems more then sufficient rather then having to splash out for virl but may look at this option if i can get away with upgrading my ram currently at 8gb. I am sorry for the long delay. I’ve been sick most of last week and I’m just now getting back into the swing of things. This isn’t bad at all, but realize this is just running the basic IOSv routers…if you were to run some of the other devices (IOSvL2, NX-OSv, CSR1000v, etc), they use more RAM than the IOSv routers, and the size of your simulations would be reduced. My opinion: I highly recommend 16 GB of RAM…and even more if you can afford it (24 or 32). You can get away with 8 GB but your simulations would be limited in scope, especially if you want to run a mix of devices, and it will probably run a bit sluggishly. It looks like I will need to buy a new pc with 16GB as minimum before investing in VIRL as running a mix of ISE which uses 4gb and other virtual devices such as F5 it all takes a toll on memory. Thanks for taking time out for investigating this for me 🙂 much appreciated. For now I will continue to watch your updates.